Non-metallic synchronous magnet drive pumps have shown tremendous growth in recent years especially amongst end-users. 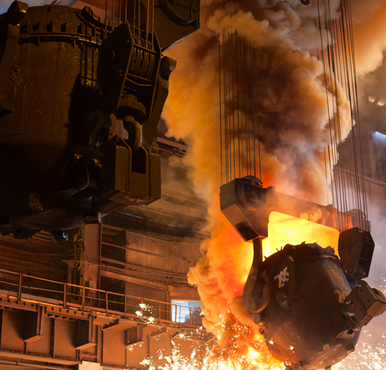 Nevertheless, many companies in the steel industry, which have extremely demanding pumping requirements due to the “high” temperatures of chemicals in combination with solids (like FeCl2 and FeCl3) do not see environmental compliance as a way to reduce costs. We will prove that the opposite is true with the Verdermag TB series mag drive pumps. Seal-less mag drive pumps have become more beneficial as an initial investment and worthwhile in terms of total cost of ownership. Reducing the required spares by introducing simple, modular mag drive design and lengthening of the mean time between maintenance are the main important factors for the growing popularity of Verdermag in both E-TFE and PFA construction. This is called pickling. Commonly used are Hydrochloric acid and Sulfuric acid for steel manufacturing. The continuous method is employed for pickling coiled steel sheet and runs a continuous roll of steel through a series of vats (basins) with re-circulating concentrations of acid help at prescribed temperatures. The steel enters the process in the hottest and least concentrated acid solution. As it moves through, it progressively passes through cooler and more concentrated acid. The maximum temperature for an optimum pickling process is 96 °C. Mag drive pumps used in this process will run intermittent (batch-wise) to fill up the storage tanks in the tank farm and upgrade the regenerated acid. To empty the trucks or rail cars the TB or GPSP-version are preferable; utilizing common parts with the normal priming horizontal pumps such as a TB mag drive seal less centrifugal pump with integrated suction chamber. Re-circulating applications are the most demanding processes, as the centrifugal pumps have to operate continuously with low available NPSH. Required flows depend upon the size of the pickling section, but the majority of applications operate between 80 and 120 m³/h. The seal-less mag drive construction prevents the Verdermag pump from leaking, as well as minimizing downtime and frequent maintenance checks. The pickling acid will be devalued as part of the process and transferred to the next vat, where its temperature will be elevated. Verdermag mag drive TB series pumps combine a stationary shaft, thrust balancing and secondary bearing design to reduce radial loads in the pump and make them capable to pump solids without damaging the pump. The concentrated waste pickling acid will be generated in a furnace under “high” pressure. The nozzle demands a differential pressure of at least 6 bar, and depending upon the customers’ plant lay out, the total differential pressure will be around 11 bar. Again, the liquid temperatures are around 96 °C. Rinsing is done with de-mineralized water, but the steel sheet will be contaminated with the pickling acid. Again conventional centrifugal pumps are not appropriate for these applications due to chemical resistance. In case of this application Verdermag has the seal-less advantage over conventional pumps. Due to the 'acid' environment the neutralization is done with mainly caustics. Verder has a wide experience with the handling of Caustic Soda. The Verdermag pumps have optimum torque transmission; even when viscosity increases at lower ambient temperatures. These fully hermetically closed pumps will not show any crystallization, which is usual in the sealing area of conventional pumps.